Suitors and Sabotage is an engaging (pun intended) story of love, art, and secrets in which there are nefarious goings-on (as well as a mischievous dog, called Jasper). Shy Imogene Chively, artist extraordinaire, has caught the interest of a young gentleman of whom her father approves. However, all does not go smoothly… or as planned when Ernest Steeple visits her at the family estate with his brother, Benjamin, by his side. Ben has been gifted with easy charm but, unfortunately, not a natural ability to draw; it’s a rather significant deficit for a first year architectural apprentice… one that he has hidden from his mentor thus far. Imogene readily agrees to tutor Ben and with the collusion of his brother and her best friend, Emily, they do so in secret. However, many complications arise as Imogene realizes that her heart is leaning away from Ernest and toward Ben. The situation takes a turn for the worse when Emily declares her love for Benjamin and they are made the brunt of nasty hoaxes and perilous accidents. But who is perpetrating these incidents and why? 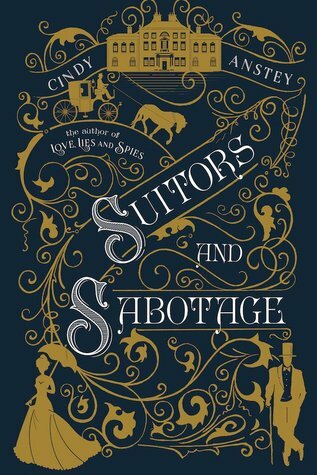 Like Love, Lies and Spies and Duels & Deception, Suitors and Sabotage is a comedy of manners—a Regency Romp. It’s a story of ruins and romance, friendship and fear, and trouble and terror. Yes, it is a comedy. I can’t wait for you to read it! I can't wait to read this book! I'm actually cheating a little because I have an ARC already. :D But I've not read it yet, so this counts! I loved Anstey's previous books and I'm sure I will adore this new one. Thanks for sharing, here's my WoW! Ooh nice! This one seems familiar somehow...yet obviously it's a new release! LOL! Hope you enjoy it once you read it! Hmmm...this sounds like an intriguing book! Great pick! I totally fell in love with Anstey via her last book, and am with you on line for this one. She does this type of story so well, and I am always eager to read another offer from an author who left me with a huge smile on my face. That is a lovely lovely cover, and I do believe I could use a regency romp in my life! I've heard good things about this author, but haven't read anything from her yet. I have got to though because this sounds like a whole lot of fun. Hope you enjoy it! LOVE the cover😀 I'll have to check out this series one of these days! The synopsis of this book made me smile to hard! I loved her first book, have the second one on my TBR, so I need to hurry and read it so I can read this one! Didn't know there was going to be another. Thanks for sharing! Haven't read any of her work and I hope this is all you were hoping for. A Regency romp - I dig it! Oh I do love this cover!!!! It does sound amazing, and I hope you enjoy it! I haven't read anything by this author, but this one sounds really intriguing!! I hope you enjoy it - and yay for having an ARC. This one looks great. I need to add it to TBR list. I have all 3 of her books on my tbr! I need to catch up so I can be ready for this one. I hope you enjoy reading your arc, Alyssa! Thanks for stopping by My WoW earlier. Now that cover looks interesting. Wow! Haven´t read the author yet, but that could change *smile* Hope you´ll enjoy your pick. Thanks for sharing. September 2017 New Release Giveaway!